Dogs are special companions for many individuals. However, some individuals need a certain kind of dog, such as a service dog. That is where Canine Companions for Independence comes in, teaching dogs from puppies to adulthood how to become good service dogs, all for free. Haddonfield resident and 27-year teacher at Haddonfield Friends School Marietta Hanigan is a four-time Canine Companions for Independence volunteer puppy raiser, and recently her third dog, Cecily II “CC,” was paired with Ava Calamia of Long Island, N.Y., a young girl in need of a constant companion. All of the dogs Hanigan raises accompany her to class each day where students teach the dogs basic commands and socialization skills for them to eventually be paired with an individual with special needs or disabilities. “A lot of people ask me how I can say goodbye to them. I tell them: I love the dogs, but they need these dogs. These dogs are going to change their lives,” Hanigan said. “Cecily is a very special dog, and we hope to have many wonderful years with her. We can’t thank teacher Marietta and the students at the Haddonfield Friends School enough,” Ava’s mom Kristine said. When Hanigan’s dog of 14 years passed away, she wanted another dog, but with her four children out of the house, she didn’t want to get a dog that would have to stay inside most of the day. That is when she remembered a group called Canine Companions for Independence and thought that would be a great way to still have a dog around while giving back to the community. Canine Companions for Independence is a non-profit organization that places specially trained service dogs with people with special needs and disabilities. Hanigan pitched her idea to the HFS head of school at the time, talking about the benefits of the program for all, and was approved. Hanigan got her first dog Hope in 2012 and has since raised three more, Tyrone, Cecily II “CC,” and now Yosemite, who will be with Hanigan until February. For Canine Companions for Independence, Hanigan volunteers to take an 8-week-old puppy and raise it at her own expense in her home and workplace until it’s about 18 months. During that time, she is responsible to train the dog in about 30 commands and expose it to a variety of experiences and situations so it is comfortable navigating everyday life with its new owner. Hanigan said having the dog at a school environment has been one of the best decisions while raising a canine companion. Not only does the dog get exposure to noise, children and different types of terrains, it also teaches the students. It is important for the dogs to get used to things such as loud noises, being pulled on by children and learning to move and interact in different places because they will need to do those things with their companion without reacting or being perturbed. “You don’t want the dog to startle to anything, so I take him everywhere,” Hanigan said. In HFS, service is a part of the curriculum, so having this service dog is a great thing to help teach the children. They learn about what the dogs do, how they change lives and who are the people receiving these dogs. Hanigan accommodates this lesson for each grade she teaches. She said one of the major benefits she has seen from the program is children are making connections to others with disabilities through the dog. They interact with them through letters and seeing them in person and are more prone to interacting with those with disabilities. “I loved that students learned they had a connection with (individuals with disabilities),” Hanigan said. Hanigan said she is sure to teach the children that this dog is not their dog, but going to be owned by someone else. This is part of the service project. Children are allowed to love the dogs, but at the end of the day, it is not for them. At the end of the 18 months, Canine Companions for Independence will take the dog for six additional months of training in about 60 commands. During that time, dogs are evaluated and, based on the dog’s different strengths, a person with disabilities is matched with an assistance dog. Only about four out of 10 dogs actually make it through this program, according to John Bentzinger of Canine Companions for Independence. Hanigan so far has had 100 percent of her dogs be paired with a person in need, all of them being children. “It’s interesting that in my classroom where I bring the dog every day and they interact with the children all day, that all of my dogs have been paired with children,” Hanigan said. 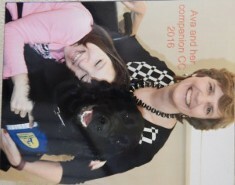 Hanigan’s most recent dog, CC was paired with Ava, an 11-year-old girl in a wheelchair who has anxiety. She has said CC has already increased her confidence, and is helping her overcome her fears of being alone, according to Bentzinger. Hanigan said her favorite part is seeing the positive impact these dogs have on the children with whom they are paired. She keeps in touch with the families when she can. 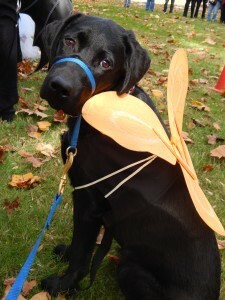 For more information on Canine Companions for Independence, visit www.cci.org.